Headlines have enormous power in shaping news consumers’ immediate impressions of an event. While purusing a print or online newspaper, or browsing news site Twitter feeds, the headline chosen by editors not only sets the tone for how the article is framed, but often represents the primary source of information on a given issue for those who either quickly skim the article, or don’t read it at all. This is why we focus so heavily on revealing and attempting to correct factually inaccurate or misleading headlines about Israel. Though errors in the body of the article (and misleading photos) are of course extremely important, headlines sometimes reveal even more concerning efforts to distort stories relating to Israel and the Israeli-Palestinian Conflict. CAMERA’s article on problematic headlines on the recent terror wave (Wave of Palestinian Violence Accompanied by Spate of Bad Writing) explained that the worst offenders “relied on the passive voice, euphemism, and imprecision — reportorial smoke and mirrors — to obscure Palestinian terror attacks and even recast terrorists as victims of arbitrary Israeli violence”. 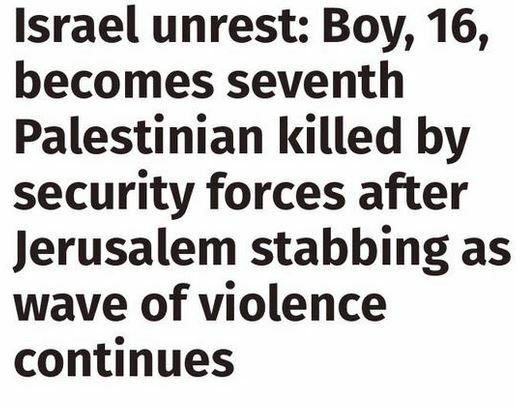 This published last October in the The Independent, reporting on a stabbing attack on two elderly Jewish men in Jerusalem (after which the 16-year-old Palestinian perpetrator was killed by police), is among the most egregiously biased headlines we’ve seen. Of course, bad headline writing is not limited to reports on terror and violence, as our post yesterday about a Times of London headline – which framed a decision by Israel’s high court, that the country’s national library was the rightful owner of Franz Kafka’s papers, into an act of Israeli aggression – demonstrates. At the extreme end of the spectrum, there are headlines which are purely fictitious. This one from 2015 – you’ll likely recall – described an event which didn’t happen and couldn’t have actually happened. So, we’d like your help. Contact us if you spot a misleading, inaccurate or inflammatory headline concerning Israel in the British media. If we agree with your assessment, we’ll post about it and – depending on the severity of the bias in the headline – contact editors in an effort to get a correction. By ‘pursuing’, do you mean ‘perusing’, Adam?